But the death (May 27) and well-attended funeral of Ron Onions (Kingston-on-Thames June 12) recently indicates that their contribution to British culture is beginning to be recognised and those who benefited from their leadership and inspiration are rightly publishing their thanks and appreciation. I was but a speck of dust in the cloud of talent, and I hope quality, that hummed and buzzed from LBC/IRN’s Gough Square. But however little and small I was in the shape of programming, news, radio/audio journalism and entertainment, it was certainly the making of me. Entrance to ‘Communications House’ at LBC IRN in 1985- the HQ from October 1973 to 1989. For most of its early years you could actually park in Gough Square and not get a ticket. Dr Johnson’s house was to the left. I do not believe any other newspaper or media organisation would have given me the equality of opportunity, support, encouragement and guidance, and a living that was fulfilling, educational, exciting, professional, and challenging. 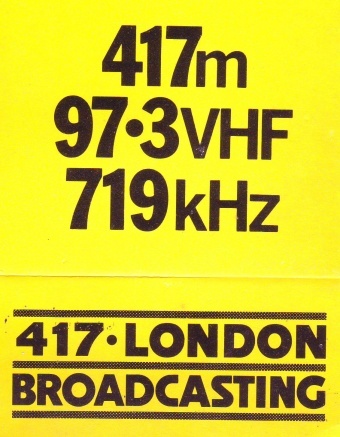 The first frequencies for LBC and a livery branding that was on its first radio car. he came from before he established himself as one of the key leaders and developers of IRN/LBC journalism and broadcasting, and what he did afterwards, has been eloquently written and published in the Telegraph, Independent, Press Gazette, and a later station he was the first programme director of- Jazz FM. Essentially he was recruited from Capital Radio to nurture and professionally stabilise a chaotic and financially vulnerable beginning to independent radio journalism. Ron Onions had a distinguished career in journalism at the BBC before risking his career going into the new world of commercial radio news in 1973. Here he is leaving for the iconic ‘Tonight’ programme- also features Tony Crabb,Peter Marshall, Terry Hughes, & Gordon Randall. Photo: Estate of Ron Onions. 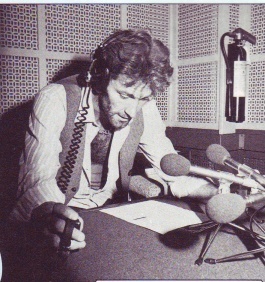 The first book written on UK independent radio by Mike Baron in 1975 reported that at Capital Ron Onions originated a system whereby ‘Newscasts were presented on the hour, twenty-four hours a day with separate newscasts on the half hour through the breakfast programme. IRN’s shaky start was due to the fact UK independent radio was developed on a local licence basis and Independent Radio News began with only one radio station (LBC), Capital started a week later, but the others were months and years away. When IRN started in October, its ‘network’ consisted of 1 station- LBC, until Capital started a week later. It took more than a year before anything resembling a network was established. The first editor, Fred Hunter, discovered that he was a staff of one. Of Ron’s move to LBC/IRN Baron wrote: ‘IRN first got itself together in its own right at the General Election in February (1974), and moved into a position where it was supplying news to LBC, and the other stations to use as they thought fit. The news area at LBC was rebuilt with IRN working from a hexagonal control desk in the middle of the room. A similar shaped desk used by LBC for London news gathering was nearby. 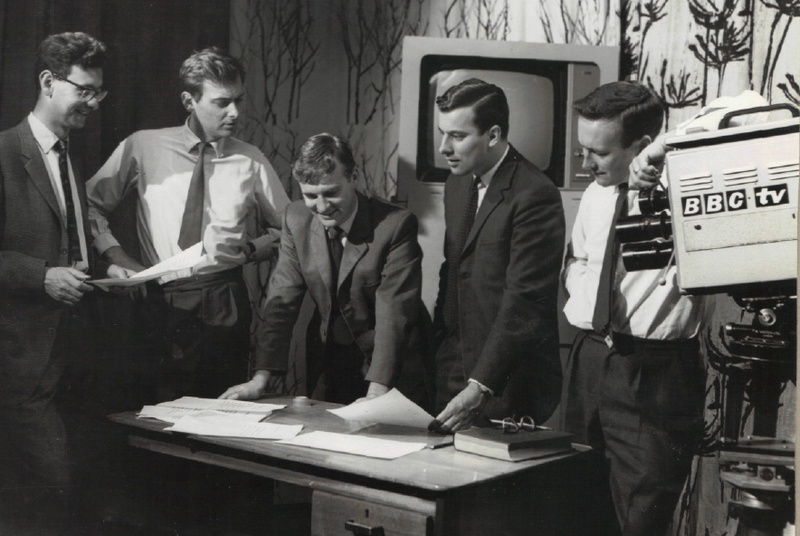 Ron Onions, Head of News at Capital Radio, became Editor of Independent Radio News, succeeding Fred Hunter who went on to work on ITN’s General Election coverage and pioneer education and training of broadcast journalism. 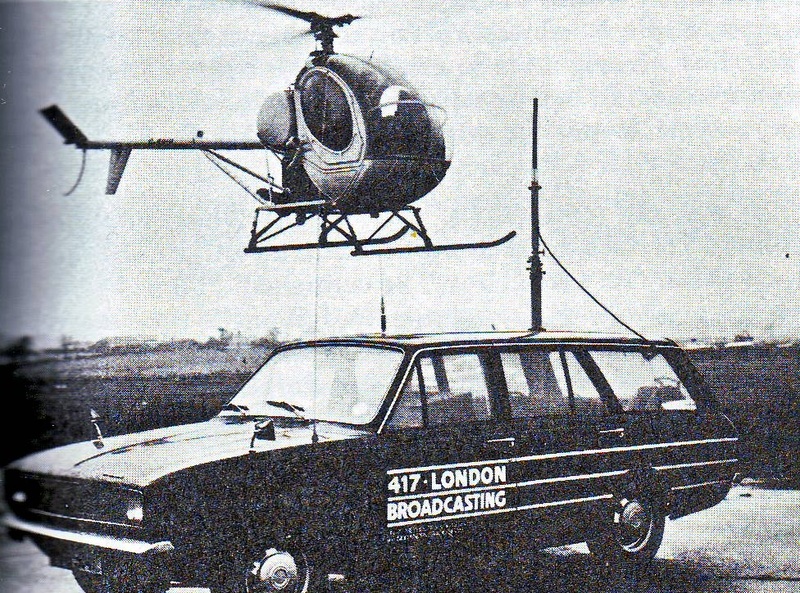 LBC/IRN’s first radio car- a yellow Hilman Hunter from British Leyland and the expensive LBC ‘AM’ traffic helicopter hired for live reports on London’s morning rush hours. An early LBC producer, Paul Easton, who coincidentally was the first man to commission a package from me, recorded an interview with Ron, in which he recalled those heart murmuring early days. The family and personal dimension, that people in work usually never get to see or hear about, is elegantly and powerfully documented in the book ‘Don’t Bring Lulu,’ that he co-wrote with his wife Doris and daughter Sarah. ‘Don’t Bring Lulu’ by Ron, Doris and Sarah Onions. Book Guild Publishing, Pavilion View, 19 New Road, Brighton BN1 1UF, UK, £17.99 plus £3 P&P, cheques to THE BOOK GUILD LTD. I could not give justice to all the talented, and I may say brilliant people, I was privileged enough to work with at LBC/IRN between 1978 and 2002. But I was lucky enough to join the community when Ron Onions was there. He was on the panel that offered me a coveted IRN reporting job while other members of the editorial management team also wanted me to continue as the legal affairs specialist covering the Old Bailey, Royal Courts of Justice and other parts of the legal system. I have written about the development of UK independent radio journalism elsewhere. A later editor and MD of IRN, John Perkins, and its last head of news information Charlie Rose and Bournemouth University rescued its sound archive– sadly after thousands of reels had been thrown away in cost-cutting space storage decisions. If you put ‘Ron Onions’ into the search engine for the archive, two fascinating reports from 1982 emerge. They reveal how Ron masterminded LBC’s successful regaining of its IBA license. He did so with progressive ideas, policies and changes to programming. He believed it was important not to ghettoise any part of London’s cosmopolitan and multi-cultural population. Ethnic communities had to be part of mainstream news and programming. He also instituted thoughtful documentary and discussion programmes on health and social issues. In order not to duplicate fine and relevant points in the other obituaries, I wanted to focus on a few reasons why the professional journalism culture nurtured by Ron Onions during the Gough Square time was historically of great value and personally remembered with such affection by those who were a part of it. What impressed me from the first day I walked into Gough Square was the quality and talent of the women journalists- producers, reporters, presenters and editors. Therese Birch and her producer Paul Easton were the first to pay me for my reports. It started with a magnificent interview with flamenco guitarist Paco Peña during which he improvised beautifully for several minutes. This was as good as anything you could hear on BBC Radio Four’s Kaleidoscope or what is now Front Row. Therese Birch, a leading LBC presenter during the 1980s in LBC editorial on the ground floor of ‘Communications House.’ Note the typewriters to her left. She is facing ‘News Information’ This is where the famous ‘AM’ show was produced. At LBC/IRN there was a climate of equality, fairness and meritocracy that I have never experienced anywhere else. The women IRN reporters were unbeatable and front-line long before Kate Adie at the BBC: Barbara Groom, Antonia Higgs, Margaret Gilmore etc. There were specialist correspondents; Carol Allen on film, and Sue Jameson on drama and theatre, Jo Andrews at the GLC, and Judith Dawson and the IRN Parliamentary unit. Vivienne Fowles was in charge of intelligence gathering or ‘News Information’- a combined library, cuttings, audio archive centre- one of the best in Britain’s news industry. She was later joined and succeeded by Charlie Rose. LBC & IRN on air studio 1985, Mark Smith (right) reading the news handing over to Andrew Gidley (left) about to read the sports. 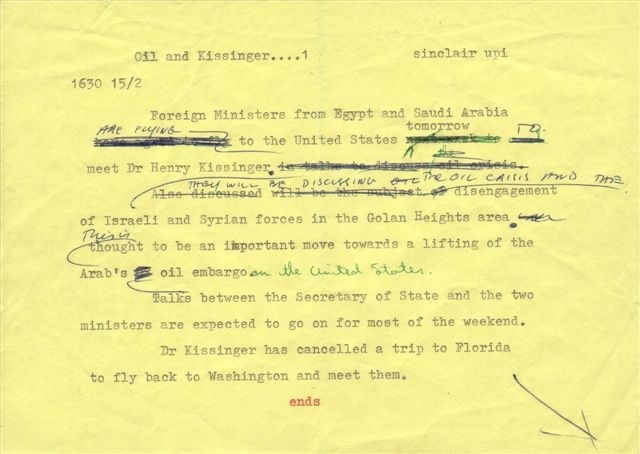 Scripts were typed up on triplicate paper pads. The yellow top was for the presenter. Mark Smith presented an evening ‘book’ programme and interviewed the world’s leading writers, including the late James Baldwin. And I also remember the women producers and sequence editors who were very much at the heart of LBC’s journalistic depth and vibrancy. I remember the late Linda Gage, married to a civil rights lawyer and immigration judge. Within weeks of my starting as IRN/LBC’s crime cases reporter, we sat down and discussed how we could remove the awful objectification of women and demeaning vocabulary present in the mainstream crime and court reporting journalism of the time. Other impressive journalists I remember from Gough Square days include Barbara Long, Diane Stradling, Sue Forster, Lise Hampele, and many others who I have to say were very tolerant and easy going with the torrent of ghastly crime narratives I would be peddling down Ludgate Hill and up Fleet Street from the Central Criminal Court. LBC’s second radio car parked in Gough Square during the late 1980s- in fact it was a converted Ford Transit and also operated as an outside broadcast studio. I may add that I was also surrounded at the Central Criminal Court by outstanding women reporters- Pat Clarke of the Press Association, Sue Clough- also of PA and then the Telegraph and Heather Mills, PA and then the Independent and Observer. IRN/LBC developed an award-winning and high ratings successful breakfast news and current affairs programme AM with Bob Holness and Douglas Cameron as the co-presenters. Long into the night, I seem to remember it was mainly women producers who set up the guests and commissioned the reports. People like Marie Adams and Martha Kearney. LBC’s ‘AM’ breakfast show presented by Douglas Cameron (left) and the late Bob Holness (right) was so successful it was well ahead of BBC Radio Four’s’Today’ programme in the greater London area for many years. The listeners voted. I won by a whisker. That’s not something you’ll hear about at the Leveson Inquiry. Other enormously impressive and distinctive women presenters included Lesley Judd, Jenny Lacey, Janet Street-Porter, Anna Raeburn, and in earlier times Joan Thirkettle, and Carol Barnes who went on to have distinguished careers at ITN. Yes, I do remember Carol Thatcher. In fact I was in Gough Square on the night of her first LBC broadcast. She was presenting ‘Nightline’- a very successful phone-in programme that ran from 9 p.m. to midnight. Second IRN/LBC newsroom in the basement of Gough Square in 1989. Digitisation meant the replacement of typewriters with word processing computers (set into the wooden desk panels) but sound was still recorded on reel to reel tape and ‘cartridges’ that contained a continuous reel of reusable magnetic tape. In 1978-9, while being trained at the London College of Printing, I was told to join a local radio station to gain experience and a track record before seeking anything more longer term at IRN/LBC. This was a rule applied by the NUJ chapels and employers in Fleet Street- which was the centre of the country’s journalism industry until Rupert Murdoch’s notorious operation to close down his Fleet Street newspaper operations, sack printers, and move News Group newspapers to Wapping in 1986. The age of recording tape- high quality and robust machines used for ‘splice’ editing. You actually cut the tape to edit out sound and used white plastic joining tape to stick it together. that made sense. In the North East of England I gained confidence and experience covering disasters, strikes, redundancy, human tragedy, triumph and despair. I learned how to be the only reporter/presenter for 3 large counties on a Sunday and Saturday shift lasting up to 14 hours. Two years later I was deemed ready for the IRN/LBC infrastructure, which added further mentoring and career development- a situation that sadly no longer exists in the industry. A lunch-time, or even a briefing from the likes of Ron Onions, Peter Thornton, and Keith Belcher was worth a hundred degrees in journalism. You were a part of history. I remember the diplomatic correspondent, the late David Spanier, returning from the Foreign Office having been briefed on the Argentine invasion of the Falklands. The Gough Square culture of journalism and broadcasting has seeded and endured throughout the media and public life in this country and abroad. A former London bulletin editor, Angie Bray, became a London MP and served in the Conservative and Liberal Democrat coalition government. In the decades since, the people I worked with there continue to achieve and blossom everywhere. Adrian Scott, who commissioned my first AM programme piece went into digital media technologies. I bumped into him years later at a high-powered exhibition at Earls Court. Malcolm Brabant became the oracle of Athens via a Sony Reporter of the Year for being the BBC’s man in the Balkans during the ugly war in the former Yugoslavia. 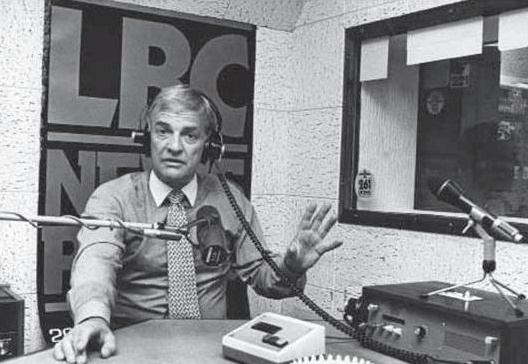 Rory McLeod seemed to have done everything entrepreneurial, educational and editorially innovative in broadcasting and was eventually MD of a succeeding generation of LBC stations. Keith Belcher who commissioned my first investigative radio documentary (into punishment regimes for children in care) returned as a future LBC programme controller. Martha Kearney, Mark Mardell, Mark Easton, Dave Loyn, Ben Brown, Tim Marshall, Peter Spencer, Simon Israel, Peter Allen- we are talking about the leading journalists and correspondents of our age. In addition to being great journalists, IRN/LBC reporters and correspondents are and were consistently great and gifted writers. This was very true of the political journalism. Every voice-report, package and Q & A by Peter Murphy had style, wit and authority and could capture the zeitgeist without being pretentious, pompous or indeed partial in anyway. Watching a professional newsroom resource the coverage of a desperately dangerous war, is something you never forget. I recall the anxiety and quiet professionalism of the intake editors Nigel Charters, John Greenwood, Vince McGarry despatching and managing young reporters such as Kim Sabido, who risked his life in battle, and Antonia Higgs, the only British woman reporter assigned to the ‘enemy’s’ capital Buenos Aires. A classic example of an IRN script provided by Paul Easton. Very often it had to be read and presented live- in the sense that the news-reader may not have seen it before presenting live to the listeners. A key factor in the IRN network success was the disciplined and highly skilled team of bulletin editors and network editors. They did not suffer fools gladly and this was especially true of Jim Keltz who became a legend in ILR newsrooms around the country; not only for his uncanny ability to know about stories breaking in their areas they were unaware of, but the wit and sharpness of his judgement on high or low standards. The LBC/IRN sports desk of journalists repeatedly challenged the BBC’s hegemony and vast resources of sports broadcasting. It repeatedly secured prestigious Sony awards and many others. It also recruited and advanced the careers of the country’s leading sports journalists. Jeff Stelling had been sports editor at Radio Tees before joining the IRN/LBC team in London. He left to develop, what most people would agree, a rather noteworthy career at Sky. BBC R4’s The World Tonight Editor, Penny Murphy, began her career as a runner on the LBC/IRN sports desk. LBC/IRN sports desk 1980s. Image supplied by Paul Easton. This was in a situation when LBC/IRN could never match the huge budgets and rights acquisition advantages that the BBC had, but the flair, speed, creativity and journalistic ability to improvise and recognise ‘the story’ often gave the independent radio broadcasters the edge. The first Gough Square sports editors were Ian Marshall, Mervyn Hall, Mike Lewis, David Brenner, and Mike Porter. The reporter/correspondents, such as Derek Mitchell, Steve Tongue, the late Dominic Allen, Colin Turner, Andrew Gidley and others would each have specialist sports knowledge, but at the same time be able to turn their professionalism to any other sport whether it was rugby, darts, snooker, horse racing or athletics. Dominic Allen’s legendary specialism was cricket. He was LBC’s original Saturday ‘Sportswatch’ presenter, before it became a two-hander with David Brenner and Jeff Stelling. Steve Tongue went onto work as football correspondent for quality national newspapers such as the Sunday Times and Daily Telegraph. Steve Rider moved to Anglia and then BBC Sport. Andrew Gidley runs his own sport news agency in Kent. Colin Turner is still working in sports television broadcasting in south east Asia. David Brenner moved into TV sports commentary; then latterly worked for 15 years as Sports Editor/Presenter of BBC World TV News. The IRN News bulletin desk in 1982. The Network desk editor, Jim Keltz is in the foreground. I really cannot emphasize the skill and art of the live IRN presenters. Some names immediately come to mind, apart from Douglas Cameron and Bob Holness, and they include Steve Crozier, Billy Bingham, Mike Lewis, Peter Deeley (a great IRN reporter) Mark Smith, and Paul Woodley. 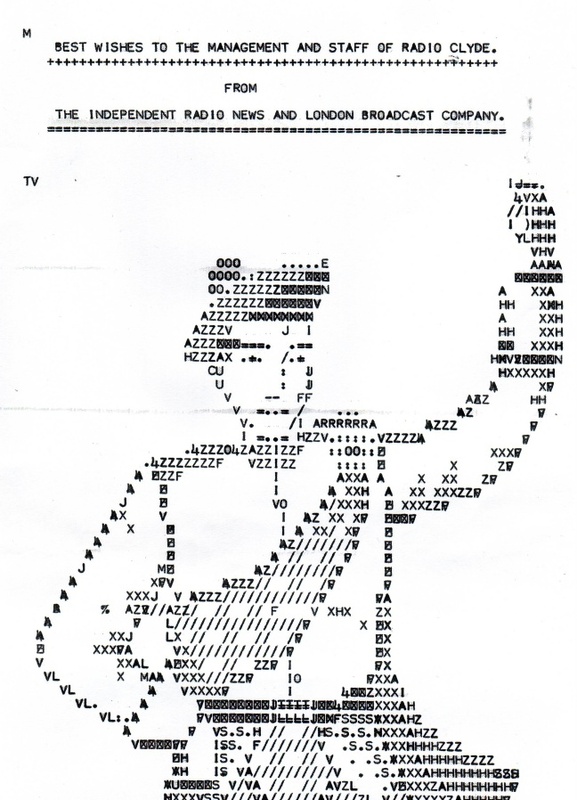 IRN/LBC presenters were multi-tasking, flexible radio communicators across all genres of hard and soft programming. Those I remember well in terms of switching with aplomb between phone-in, news bulletin, and light entertainment include Steve Jones, Clive Bull, Mike Allen, and Brian Hayes. They were not dependent on scripts, which meant they could fill time with their thinking followed by speech that would inform a constant flux of varying time frames set within the locks of bulletin schedules and commercial spots. As a young man, you were supported and counselled by generations of experienced and established journalists who knew about life and could talk to you in ways your parents, if they were still alive, could not. I remember David Spanier telling me of the greatest joy in his life when being there to see the births of his sons, Dickie Arbiter (Royal Correspondent) challenging my inability to appreciate being nominated for a reporter of a year award- ‘That’s a great achievement and something you should always be proud of,” he said kindly as I tried to hide it in my bag from embarrassment. Robin Malcolm, a leading sequence editor of ‘AM’, later a programme controller of LBC. Innovative and ready to take risks. He asked me to do provocative editorials on the legal system (High Court judges would ring up to complain) and then supported my adventures in radio drama with Richard Shannon. Keith Belcher was later understandably cross that I returned from New York in 1993 without telling the management that I had picked up a New York Festival Grand Award achievement for an LBC radio drama. He pretended to strangle me in mirth. One of IRN/LBC’s most challenging days was the Great Storm of 1987. The AM programme had to be presented from the radio car in Gough Square. Power and telephone lines were down all over the country. I was living in Manningtree, Essex at the time. I got through to the newsroom on one of the first cellphones and filed a report about rumours of people being trapped in a collapsed building in Clacton, a converted ferry accommodating Tamil refugees being washed aground at Harwich, and a fuel tanker dangerously snapping its mooring at Felixstowe. Later that morning I actually escorted an army rescue team from Colchester barracks to Clacton because I knew the back roads and was one of few people venturing out to find out what had happened. One of the News Production booths at Gough Square (known as NPs)- an image familiar to the reporters and producers who worked there. Creative news features were fashioned by self-drive mixing carts with sound bites with voice to microphone and recording onto reel to reel tape or another cartridge. There are hundreds of people I have had the joy and pleasure of working with and I give brief and cursory mention to just a few and unfairly neglect to reference the many- perhaps there can be another time and place should people be interested. Why was IRN/LBC so successful in this period between 1974 and 1989? I think being part of a plural and dynamic journalistic industrial centre that was Fleet Street was significant. Gough Square was journalist intensive and the editors and managing directors were journalists first. This was true of later editors and programme controllers such as Phillip Bacon and Robin Malcolm. The IBA, the first regulator, insisted on public service and qualitative values and criteria. Engineering was invested in and ring-fenced as a regulatory condition. Roger Francis headed an impressive and reliable team of sound engineers and equipment and studios that took a beating 24 hours a day, but worked and delivered. There was not over-licensing in the London market. So the economies of scale maintained and supported high quality programming and content creation. The prevailing economic and political ideology encouraged investment in media as a public service and not asset-stripping or high profit exploitation for shareholders. The IRN intake news desk in 1982. This was the pre-digitalisation and Internet age. Sound would be recorded on cassette, edited on reel to reel spools, and news reports would be recorded on tape loops in plastic cartridges. There was a strong partnership between management and professional trade unions that was more mutually supportive of business objectives than destructive. Quality content, properly remunerated and loyal staff and freelances meant high audiences, strong advertising and viability. I remember people enjoying their work, being encouraged to take the initiative, generate ideas, creativity and follow their ambition. An IRN newsreader from the early 1980s- featured in an IBA Yearbook from the time. The regulation even had a quality return on profit taxation- it was called secondary rental. LBC could hold onto the secondary rental profit if it spent the money on ‘cultural programming,’ or training. We got to produce Chaucer’s Canterbury Tales in modern English. How cool is that? LBC and IRN was also well ahead of its time in the nature and flexibility of its contracts with freelance specialists. In the early 1980s editors realised that I could expand and enhance my coverage of the legal system by running my own news agency, securing arrangements with other publishers and broadcasters as long as the news came to LBC and IRN first. This meant that for several years I was able to successfully work with Tim Knight and we shared the coverage between the Old Bailey and Royal Courts of Justice. 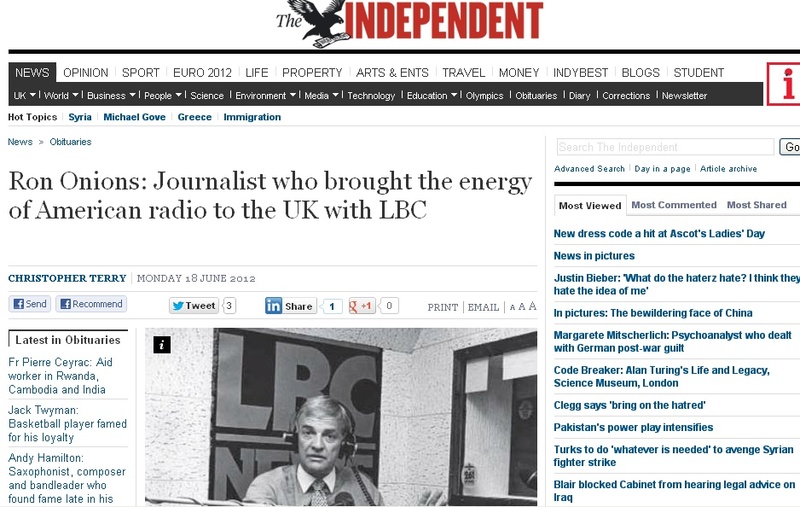 LBC and IRN worked together, shared resources, and its journalists had interesting, creative and inventive career paths. 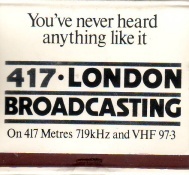 Obviously instead of being bought by an incompetent foreign company in 1989, forced to split its AM and FM frequencies into two new stations, leave Fleet Street for West Kensington, it should have stayed where it was, been run by a business in media for the long-term and been awarded a national FM or AM frequency. Early LBC branding from 1973-4 cigarette matches- yes we have left behind the smoking in newsrooms which is without doubt a very good thing. IRN/ LBC of this period with affection, respect, admiration and nostalgia. All of the best innovations, ideas, pioneering techniques and the talent bubbling out of Gough Square in the magic that is radio was stolen, bought, or hired elsewhere. All I can say is thank you Ron and all the other wonderful spirits no longer with us in this mortal world. I am told by physicists that everything IRN/LBC broadcast in those years is still travelling through time and space. Perhaps we will all be catching up with it eventually! Great post, Mr Crook. Wonderful memories of excellent times with superb journalists. And I also very fondly remember playing cricket in the newsroom with rounded, bunched up paper for the ball. A place of hard, often fast work but also great fun. Well said – LBC was a magnificent school for otherwise inexperienced but gifted self-starters who were allowed to sink or swim by Onions and Bacon the presiding inspirations. I was allowed to play with a radio station for four weekends – after which I was allowed to work there without a contract for seven years – after which I was told my listening figures were most encouraging and would I like to work there for seven days a week? I said let’s try five and could I have a contract (yes, if you must) but it was the job of a lifetime. Ron Onions was a tremendous enabler of talent. I also personally rescued about 300 hours of key archive which has now been returned to LBC. Phillip Hodson. Dear Phillip, thank you for this and preserving 300 hours of LBC heritage- something you were very much a part of in pioneering live interactive counselling on the radio and establishing a genre of programming that was professionally ethical, educational, therapeutic and inevitably, in media terms, entertaining. Excellent stuff. So many memories brought back. I remember Douglas’s great storm broadcast too while listening down the line from GWR Bristol. I still bear the scar from an overnight game of cricket with the rolled up ball of Sellotape. It was inflicted on me by one Terry Plane, one of the countless Aussies who kept the place going in the mid70s. He was a script writer on the IRN desk – by then I was a bossy Chief Writer. In years to follow, my family and I emigrated to Adelaide, and ended up working for the aforementioned Terry Plane at Channel 7. Thank you Derek for your reminiscing. IRN hosts annual awards for radio journalism in UK independent radio and celebrated 40 years of IRN news in Soho last night. Former editor John Perkins, Andrew Bomford (now a BBC correspondent) and I were asked to describe our role in its history. There was an excellent 10 minute slide-show that retrieved the reporting of some of the history over the last 4 decades. All of the LBC/IRN veterans of the 70s, 80s and 90s have every reason to remember Keith with so much affection and respect. He combined kindness, astute judgement of character, calm leadership, editorial robustness and sent out waves of confidence. Add to that a great sense of humour and it means going to work in a Keith Belcher newsroom was something to look forward to. In 1979 he found a budget of £500 to fund an investigative documentary into the alleged abuse of punishment regimes in secure care homes for young people. The fact he was prepared to trust me, a 19 year old rookie to do the job, who 18 months earlier had been emptying LBC’s dustbins for the Corporation of London, shows enlightenment and inspired risk-taking. I was able to share with him all of the things we could not broadcast because of the laws of libel and that understanding paved the way for navigating a constant struggle for journalism against the forces of authority and power. He even took the trouble to write a letter of sympathy after a dozy freelance producer had crashed some of the key and poignant parts of the documentary output with wrongly scheduled adverts. Keith was also a perfect trainer. What a coup to be able to book him to teach radio journalism at Goldsmiths. It was not going to last as the industry always came knocking at his door to set up and launch new newsroom and speech broadcasting operations. My respects and condolences to you Kay and all members of your family.